We’d love your help. Let us know what’s wrong with this preview of Bertolt by Jacques Goldstyn. To ask other readers questions about Bertolt, please sign up. What age is this book best for? Rachel Our daughter is 2 months shy of 3 and loves this book. I love this book, too. So late toddler-adult. This is the fifth of seven, Bertolt—funny that as a literary type guy, I would think it might be about Bertolt Brecht (wrong!). It is a book about an imaginative (which is not to say imaginary, though this is fiction) boy whose best friend is an old (at least 172-years-old!) oak tree named Bertolt. It’s a book about a solitary kid, and his imagination (obviously), the construction of a relationship, and then, more surprisingly, it’s about loss and grief, but I won’t ruin that surprise for you with any specifics. Goldstyn did the story with subtly (which here means the opposite of LOUD and bold primary) colored and drawn illustrations to match the gently whimsical and reflective themes. Huh. That was the exact thing I said when I realized the last page was indeed the last page. I had to check, make sure. Huh. I loved the idea of a hero in a children's book who embraces--loves!--living a daily solitary existence. I appreciated the talent of the wispy, potentially expressive line art, even though it did nothing for me personally. I loved the idea of watching the world, of matching value for the life of nature--a tree--to the life of things more commonly valued--people, pets. But i Huh. That was the exact thing I said when I realized the last page was indeed the last page. I had to check, make sure. Huh. Not very often does a book manage to pull off being charming. This book was sweet, smart, funny and charmed me into loving not only the book as a whole, but also into wishing that the main character was a serialized cartoon and could have more adventures. A book I read in a sitting and handed directly to my eleven-year-old. What a sweet tale about a kid who plays alone, and likes it that way. Brilliant book for the loners who might not know it's okay to play alone. It's also a poignant story about loss, and how we cope. Awesome book. My kids LOVE this book. It's been read at least twice a day since we picked it up from the library. It's about a little boy who describes himself as a loner. People aren't always nice to those who are different, but he doesn't mind. He has fun by himself. There's a wordless page showing what he does alone (Rowan asks every time how he plays chess by himself lol). But his favorite thing to do is climb his tree Bertolt. His favorite time of year is spring, when the leaves become a maze. When the b My kids LOVE this book. It's been read at least twice a day since we picked it up from the library. It's about a little boy who describes himself as a loner. People aren't always nice to those who are different, but he doesn't mind. He has fun by himself. There's a wordless page showing what he does alone (Rowan asks every time how he plays chess by himself lol). But his favorite thing to do is climb his tree Bertolt. His favorite time of year is spring, when the leaves become a maze. When the boy realizes that Bertolt has died, he comes up with a solution to save him from becoming toothpicks. I found it weird that the last few pages didn't come with any words, but my kids loved these pages, filling them in for us and cheering for the boy. We talked about whether or not the boy's plan would work long term. I really liked the message that you should embrace your differences despite what others think or say. It also dealt with dealing with the death of something you love. A quiet boy loves spending time alone in nature, especially within the branches of a giant oak tree that functions as the boy's best friend. The heartwarming ending picks up an important theme and symbol from the beginning, strengthening the story's structure. The subdued palette of the folksy drawings complements the story's themes. The boy's acorn hat deepens his characterization. This book fills an important niche for kids who are introverts, loners, and/or nature lovers. And kids who aren't ca A quiet boy loves spending time alone in nature, especially within the branches of a giant oak tree that functions as the boy's best friend. The heartwarming ending picks up an important theme and symbol from the beginning, strengthening the story's structure. This book fills an important niche for kids who are introverts, loners, and/or nature lovers. And kids who aren't can take away the important messages of being your own person regardless of what others think and the power of solitary contemplation. This surprised me. The illustrations are really great. The story is sweet. Kindness. Individuality. Loss. So much all wrapped into one. Excellent book about being a loner and spending your time with trees and animals. SO good. Quirky and (literally) colorful. Breezes by tough problems with calm defiant buoyancy. Told in the voice of a young boy who is different from the others around him. He doesn’t mind wearing different colored gloves after he can’t find his lost one. He enjoys being alone most of the time, unlike the others in his town. His favorite place to be alone is in a huge oak tree that is named Bertolt. The boy spends his days up in Bertolt’s branches, weathering storms together, making friends with the animals and birds that live in the tree. The boy looks forward to spring when Bertolt’s le Told in the voice of a young boy who is different from the others around him. He doesn’t mind wearing different colored gloves after he can’t find his lost one. He enjoys being alone most of the time, unlike the others in his town. His favorite place to be alone is in a huge oak tree that is named Bertolt. The boy spends his days up in Bertolt’s branches, weathering storms together, making friends with the animals and birds that live in the tree. The boy looks forward to spring when Bertolt’s leaves will return and become a splendid green shelter again. But when the other trees burst into flower and leaf, Bertolt doesn’t. Eventually, the boy must admit that Bertolt is dead, but what does one do when a tree dies? The boy figures out exactly the right thing. Some real winners in the village. (Maybe their behavior inspired the boy to become a thief at the end?) Also, do his parents know that he is hanging out in a tree during storms? I know this book is supposed to be a quiet philosophical inspirational thing, but it made me cranky. Finally, note to the proofreaders: the font changes on the page that says "I know what to do when a cat or a bird dies. But what should I do for Bertolt?" Although it probably won't work as a group read aloud due to the small size and tiny details in the illustrations, but, for those youngsters who are loners, yeah!!!! Too many times we make introverts think there is something wrong with them and that they, "need to play with others." This book will encourage even extroverts to try some time alone, enjoying nature! A quiet story to share with introverts in your classroom. Lovely, soft illustrations. Would pair well with Wishtree or Sequoia. Best described by the book jacket "a story about loss, sorrow, and acceptance... and how through play and observation we come to know ourselves." Basically, an introverted boy loves an old oak tree, but the tree dies. The boy says, "when you're different, people can laugh at you, or even worse." I wish the author had avoided this part; the description/depiction of the boy as introverted effectively normalizes introversion, but the comments about it promote the common us/them mentality with respect to intro/extraversion. In short, it will only make introverted readers self-conscious about their introvertedness, which will lead to shame or a Basically, an introverted boy loves an old oak tree, but the tree dies. The boy says, "when you're different, people can laugh at you, or even worse." I wish the author had avoided this part; the description/depiction of the boy as introverted effectively normalizes introversion, but the comments about it promote the common us/them mentality with respect to intro/extraversion. In short, it will only make introverted readers self-conscious about their introvertedness, which will lead to shame or a sense of superiority. In general, the stuff about the tree and about the boy's relationship to it is quite good. There's a sense of wonder and of friendship with the natural world, as well as an implicit summons to the reader to go exploring. The only weird part was on the page where the boy describes and the illustrations show what he saw from up in the tree behind the leaves--"Marie, the lawyer's daughter, kissing Kevin"; "the Tucker twins, who steal bottles from the grocer and sell them back to him"; "the postman setting his traps"; "and [the goat] Cynthia eating corn." The implicit message seems to be that the non-human world is lovely and the human world ugly, which admittedly is often true, but kids don't need that message from this book. The part about the oak tree dying is poignant. The boy provocatively comments on the hiddenness of dying in the tree's case. He doesn't see the tree die; death only manifests itself after the fact in the oak's failure to bloom in the spring. This review has been hidden because it contains spoilers. To view it, click here. It's nice to have a picture book to read one-on-one with a child who is "what you call a loner" and could use support for just being their own quirky self, and this is sweet for that person, but it is not compelling enough or sublime enough to do the heavy work of showing the world the deep value of being solitary - the one who is unique, different, able to be alone and content and who then ultimately is doing some work or task that turns out to be monumentally significant. You may say that the It's nice to have a picture book to read one-on-one with a child who is "what you call a loner" and could use support for just being their own quirky self, and this is sweet for that person, but it is not compelling enough or sublime enough to do the heavy work of showing the world the deep value of being solitary - the one who is unique, different, able to be alone and content and who then ultimately is doing some work or task that turns out to be monumentally significant. You may say that the book doesn't have to do that - but I think it does, because I do believe that is what quiet, alone, focused, people do: something momentous! And the rest of the people - the joiners, the cooperators, the team players, side-by-siders, go-alongers, they often have a very hard time with the loners. They can't just leave them alone; they pester them or marginalize them so that the loner has to re-assert their unique identity. A little boy who enjoys doing things alone tells readers about his favorite spot, an old tree he's dubbed Bertolt, and all the fun he has there. When Bertolt fails to produce leaves one spring, the boy must come up with a plan to save his friend. A cute story about a boy's love for a tree hang out/adventure spot. It's a bittersweet tale. The boy comes up with a cute and creative way to save his friend but the realist will wonder how long it will last. (The realist was also probably screaming at h A little boy who enjoys doing things alone tells readers about his favorite spot, an old tree he's dubbed Bertolt, and all the fun he has there. When Bertolt fails to produce leaves one spring, the boy must come up with a plan to save his friend. A cute story about a boy's love for a tree hang out/adventure spot. It's a bittersweet tale. The boy comes up with a cute and creative way to save his friend but the realist will wonder how long it will last. (The realist was also probably screaming at him that he's going to die when the boy talked about hanging out in Bertolt during storms.) If you want a slightly nicer version of the giving tree, this might be the picture book for you. The book is charming, and the simple illustrative style embodies the innocence of the story. The narration is in first person, which makes it so heartwarming and does a beautiful job in tugging at your heartstrings. What's incredible about this book is that even in it's simplicity it manages to pack in an abundance of In life, you don't need a lot of friends. You only need one good friend who is by your side, day after day, through thick and thin. For one little boy, that best friend is Bertolt. What's incredible about this book is that even in it's simplicity it manages to pack in an abundance of themes, from imagination, independence, loss, sorrow and acceptance. This is the story of a boy and his best friend, a tree named Bertolt. The boy loves climbing Bertolt's branches, hiding in the leaves, and looking out over the town. After Bertolt loses its leaves in the fall, the boy anxiously awaits the return of the leaves so he can climb again. But Bertolt's leaves do not return. I enjoyed the illustrations in this book more than the story, but the story was good. Not great, just good. I liked the beginning, didn't like the middle, but loved the ending. "But me ... I'm what you call a loner. I do stuff by myself, and it doesn't bother me one bit. Just the opposite." Bertolt is a very big, very old tree that the main character loves to climb. He can hide among the leaves and see everyone else, though they can't see him. He can see for miles around. He makes friends with the squirrels, birds and even the bees. But when all the other trees have started to get their leaves, Bertolt remains bare. The boy knows that Bertolt is dead and he must do some "But me ... I'm what you call a loner. I do stuff by myself, and it doesn't bother me one bit. Just the opposite." Bertolt, an old old tree, is one little boy's best friend. He has the best time playing among the branches in spring. When spring comes around again, however, he discovers Bertolt has died. How can he honor his beloved friend? This is such a sweet story! It deals with emotions, being a little different from others, death and loss, as well as friendship. The illustrations are lovely pencil sketch with minimal color. Recommended for kids over the age of five because it has a lot of pages, almost l Bertolt, an old old tree, is one little boy's best friend. He has the best time playing among the branches in spring. When spring comes around again, however, he discovers Bertolt has died. How can he honor his beloved friend? 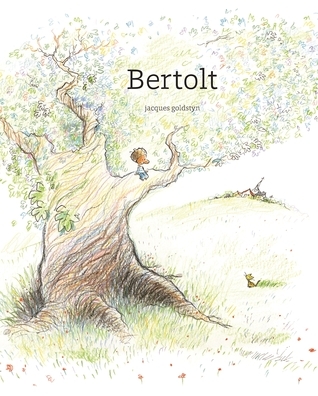 made my list of "Gorgeous picture books that capture magical independent childhoods:"
A boy embraces his introversion and spends much time in an oak tree he names Bertolt. From there, he views the world in all seasons. Unfortunately, one spring, Bertolt does not bring forth new leaves. He has died. It's a nice point about how knowing about the death was not a sudden thing, but gradual.